Song is varied series of bubbling notes and buzzy trills, all at different pitches; often prolonged. Description: Sexes similar. 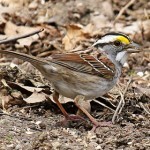 Light brown above with black streaks; unmarked grayish underparts; solid brown, finely streaked crown (lacks white middle stripe as in Clay-colored Sparrow); brown ear patch bordered by fine black eye line and two parallel whisker stripes; distinct white eye ring; grayish-white eyebrow; two buffy wing bars. 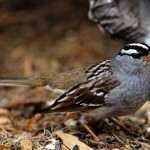 Juvenile is lightly streaked on breast and sides and lacks grayish-white eyebrow. Habitat: Open scrublands, especially short-grass prairies with sagebrush, rabbitbrush, and other semiarid shrubs. 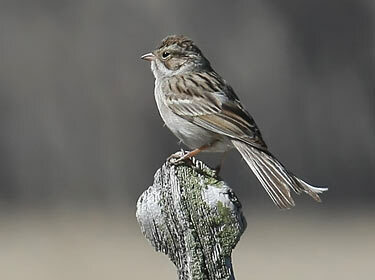 Where in Nebraska: Common spring and fall migrant in western Nebraska. Local summer resident in extreme western Panhandle. 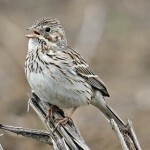 Field Notes: Has two distinct nesting populations, one in meadows of Yukon Rockies, and another in sagebrush deserts. Fun Facts: The Brewer’s Sparrow can survive for extended periods of time without supplemental water, getting all they need from food.